Hello everyone! Welcome to another edition of the Tutorials & Tips Link Party! I know you all have been creating up a holiday storm, and I can’t wait to check out your projects and feature those that catch my eye. Holiday Home Tours have been in full swing for over a week now and Part 1 of mine went live today. If you missed it, I hope you’ll check it out here. So much work is involved in putting together a Christmas tour, and frankly I’m now exhausted but glad to have my decorating mostly done! I still have a bit more to do for the second home tour I’m participating in on Thursday. As I was talking to some of my fellow blog friends today about how amazing all of the tours are this year, we remarked that they just get bigger and better every year. Sometimes instead of feeling inspired by all of that beauty you can begin to feel inferior. We’re human. It happens. I frequently have to remind myself that comparison is the thief of joy, and I want nothing but joy this season! Let’s claim joy in our niche and shout down those inner voices that sneak in to rob, steal, and destroy! You are amazing, and I stand in awe of the gifts God gave you. Thanks for sharing your talents for creating beauty out of chaos with the world! 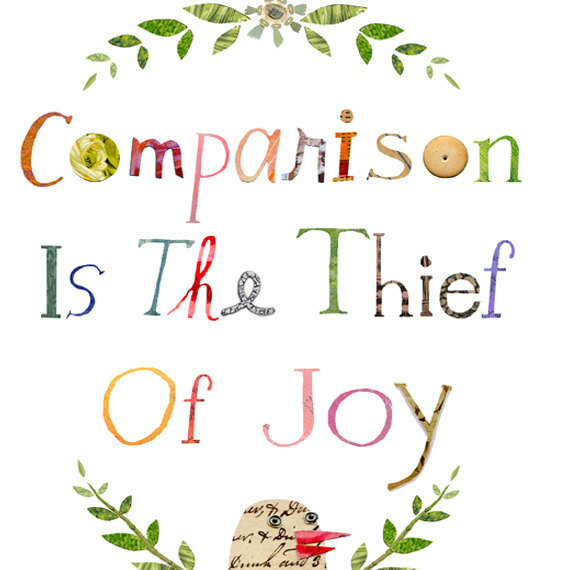 Thank you for featuring my “Comparison Is The Thief Of Joy’ print, it is perfect for this post. Warm holiday wishes to you and your readers! Thanks so much for hosting Beth, have a wonderful week!! Thanks for the great reminder! I’ve definitely been feeling a bit of that right now- with young kids and renovations on the go we’ve kept it pretty simple this year. As always- thank you for the wonderful linky! Thanks for the reality check. Great stuff linked up this week. That is such a great quote- thank you so much for sharing it. I was dreaming of slightly more sophisticated Christmas decor this year but my teenage sons had such fun putting up all the same old stuff we have always had I had to take a step back and realise what matters. Then this morning I read this. Perfect! Thanks so much for hosting Beth and have a wonderful week! Thanks for a great party, and I’ve loving the Christmas decorations. Thanks for the great party! Have a good week! Such an awesome message, Beth! And you are totally right. I find myself getting into the comparison game too, and I have to remind myself not to let in the negative emotions. It’s all about simply creating beauty with what we can around us. I am constantly inspired by you. Wishing you lots of joy this week!